Whenever anyone hears of Dolphin Fishing Miami – they typically respond with horror since they think you’re fishing for Flipper. The other dolphin (Mahi-Mahi) is a fish unlike the bottle-nosed marine mammal which also shares its name. Along with being incredibly fun to sport fish, Mahi-Mahi are delicious and a staple cuisine among South Floridians. These fish are admittedly not as exciting to reel in as a shark or tarpon, but have their own unique excitement and are much tastier. The Mahi-Mahi lives in large groups together which need to be found by expert fishermen like those on the crew of THERAPY-IV. Once you have found a school of Mahi-Mahi, you can start fishing and possibly pull in a large amount of mahi-mahi that can feed you and your family with delicious fish all weekend. Mahi-Mahi can grow to large sizes but typically don’t exceed three to four feet in length and up to 100 pounds. These fish are large but not too large for your family to catch. Miami Beach Deep Sea Fishing for Dolphin is particularly nice as a family outing because there is a medium difficultly level to catching dolphin. They are not the most attractive fish in the world but they do have a beautiful shiny blue and green exterior. Since this fish in incredibly popular in the tropical waters of South Florida, it becomes a must catch for tourists visiting. Despite their homeliness, some do still find them to be nice prize fish for your wall or a photo. Their vibrant color pattern and strange bulging forehead make it very unique in appearance. Even if you’re not fishing for Mahi-Mahi, be sure to enjoy this fish in any South Florida restaurant on or near the coast. This is one of the most popular fish served in Miami and Miami Beach seafood restaurants. Of course, fish always taste better when you have put the work into catching them and get to have them fresh. Note: While you’re wining and dining, take half-a-day to stop by the Haulover Marina for an epic Miami Deep Sea Fishing excursion with the quality crew of the THERAPY IV. Hosted by famous chefs Michael Chiarello and Joel Huff at the famed Azul restaurant in the Mandarin Oriental Hotel on Brickell Key, this event is considered one of the best of the entire festival. Enjoy Napa-style food and wine in one of the finest hotels in all of South Florida. Celebrity chef Bobbly Flay will be at the famous Raleigh Hotel in South Beach Saturday, whipping up American-style beef dishes. This is a great event to attend since it will be in the heart of all the Food & Wine Festival action. If you are one of the thousands of people waiting to see what the new Miami Marlins Stadium looks like from the inside, you should attend this event Saturday. Julie Loria, wife of Marlins owner Jeff Loria, will be hosting this event and be joined by Marlins players. Guests will dine with the new state-of-the-art Miami Marlins Stadium as their backdrop. This isn’t the only Marlin experience you can have this weekend; take a Marlin Fishing Miami trip on THERAPY IV for the full experience. Whether you’re a wine aficionado and/or wine drinking aficionado, a wine seminar is a great way to soak up as much wine and wine knowledge during this weekend. This event will be held Saturday at The PERRY in South Beach. First things first, some rumors need to be cleared up about sharks. While they are incredible predators, their threat to humans is minimal. Shark attacks are incredibly rare and there are few sharks big enough, aggressive enough and confused enough to go after humans. That being said, sharks are pretty incredible creatures. Being the nearly undisputed apex predator of there habitat - these creatures have fewer numbers than their prey, hard to spot and very difficult to catch. To catch a shark on a Shark Fishing Miami trip, you need patience, strength and the expert crew of the THERAPY IV. Here are three sharks you could catch on your next Miami Deep Sea Fishing Excursion. Unique in appearance and nearly unmatched in strength and aggression - this is the fish you've waited your whole life to catch. Its distinct hammer-shaped head make it easily recognizable at the end of any fisherman's line. If you have it in you to pull one of these on board - it could mean an incredible prize, unparalleled accomplishment, and picture you can brag about to your friends for years to come. This is a less common shark in Florida. The Tiger Shark gets its namesake from beautiful stripes on its back that make it easy to discern when caught. This shark is well known for its incredibly sharp teeth, hot temper and incredibly hard bit - a dangerous combination. This is quite possibly the meanest, most aggressive shark you will come by in South Florida waters. With a size of up to 11 feet in length and 500 pounds, this nasty shark is extremely tough to catch and reel in. To give you an idea of their aggression, this shark has a tendency to head-but their prey before attacking. Reeling in a Bull Shark could be the ultimate prize on your deep sea fishing excursion. The Miami International Boat Show kicked off today in great fashion. With amazing boat exhibitions, events and boating enthusiasts pouring in from around the world, this is shaping up to be the best boat show in recent history. 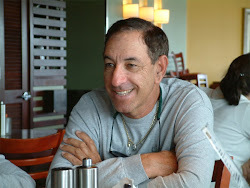 Miami Beach Deep Sea Fishing Captain Stan Saffan and the crew of THERAPY-IV would like to welcome all tourists and boating enthusiasts to this annual event. Below is a "To Do List" for this exciting weekend. Quick Reminder: You should definitely consider stopping by Haulover Park Marina and going on a Miami Shark Fishing, marlin fishing, dolphin fishing, tarpon fishing or other fishing adventure. 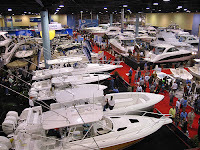 As the epicenter of all Miami International Boat Show Activities - visiting the Miami Beach Convention Center is a must. 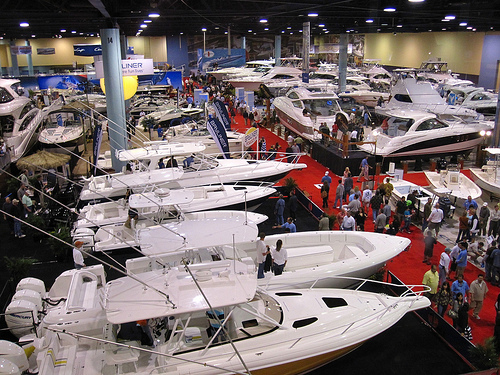 This year's show has more than 200 exhibitors with the latest boats, boating parts and more. If you're looking to buy a boat - this is the best place to see a wide variety of boats at the best possible price. If you're looking for a smaller venue with luxury yachts, the Sea Isle Marina is a great place to rub shoulders with elite boating enthusiasts and see some of the most spectacular yachts on the market. This event is right next to the beautiful Venetian Causeway and should have less traffic than the Convention Center. If your main interest is sail-boating, then this is the place for you. You'll be able to see hundreds of beautiful sailboats right on Biscayne Bay. Whether you are there to buy or just see the beautiful spectacle - this weekend should be full of both. Tarpon may seem like a boring fish when compared to the flare of the Sailfish or the danger involved in shark fishing, but most fishermen know that Tarpon Fishing Miami is the ultimate deep sea excursion. The Tarpon not only grows to nearly 8 feet in length and 280 pounds but it has some unique attributes and behavior that makes them both challenging and a great prize for any fisherman. Below are the three main reasons Tarpon are the best catch – for those going on Miami Deep Sea Fishing adventures on Therapy IV. Interesting Fact: The Tarpon has a swim bladder which is a pseudo-respiratory organ which allows them to take in small amounts of oxygen from the water’s surface. This is why this creature can be seen often in shallow water. This is one big fish. They can be found in shallow water where you can get a really good look at these monster fish. Growing up to 8 feet in length, some fishermen in small boats have trouble even getting these beasts on board (that won’t be a problem of the 58-foot Therapy IV fishing boat). They can weigh up to 280 pounds – that weight mixed with their agility and speed makes them extremely difficult to reel in. Eight feet long and 280 pounds does not slow this fish down a bit. Still lightning fast and agile, this fish is known for jumping high into the air while on the line. This not only makes for a spectacle, it keeps you on your toes while reeling them in. Fully matured Tarpon often find themselves in altercations with sharks, alligators and porpoises because of shared habitat so they are battle hardened. The best prize fish is the one that takes two people to hold up in a picture. This is one of the few fish you can catch that will legitimately be larger than you. If size matters when it comes to prize fish, than Tarpon is the ultimate prize. People have been terrified of sharks long before Spielberg’s Jaws. Humans are the dominant species on land, but in the sea it’s a totally different story. These menacing predators are not to be taken lightly – and only trained professionals should intentionally handle them at all. That being said, the expert fishermen on Therapy IV know exactly how to find and catch the deadliest predators in the ocean. Listed below are the types of sharks you could find on the other line of your fishing pole while on Shark Fishing Miami excursions on Therapy IV. This shark is typically 6 feet in length but can reach enormous size up to 20 feet long and 1,000 pounds (that’s a big fish). A vicious predator, it gets its namesake from the hammer-shape of its head. There are many different species in the world but Florida is popular for the Scalloped and Bonnehead shark. Catching one of these sharks could be the ultimate prize for a fisherman. This shark gets its namesake from the yellowish appearance which is a peculiar color for this type of creature. They can grow up to 12 feet in length and have odd shape teeth, adding to their unique characteristics. Lemon sharks are more solitary creatures than most so they are hard to find and catch. The Nurse Shark is very common off the coast of Southeastern Florida and the Keys. These ocean floor dwelling predators travel in groups up to 40 and can grow up to 15 feet in length. When it comes to shark siting’s off the coast of South Florida – these are the most common. Catching these sharks can be relatively easy if it’s a younger, smaller Nurse Shark. However, a full grown adult weighting up to 330 lbs could be a much greater challenge. 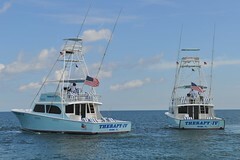 For more information on Miami Deep Sea Fishing on Therapy IV visit Therapy4.com . Nothing beats a good day out on the boat with beverages, friends and some of the most challenging catches Miami Deep Sea Fishing has to offer. If you find yourself with a fish on the line that’s quite difficult to handle, you may have the catch one of the following monster fish. Therapy IV fishing adventurers encounter these fish on a daily basis and here is a top 3 ranking of fish to catch based on difficulty, fun and overall prize. Nothing beats the feeling of catching the ultimate aquatic predator. Whether it’s a Nurse Shark, Hammerhead or other sharks native to Florida - this is one tough catch. Strong stubborn and dangerous, sharks can give you a workout on the other end of the pole. However, in the end, catching a shark is a once-in-a-lifetime experience that lets you top some of the deadliest predators on earth. The Sailfish may not be as deadly or dangerous as the shark, but what it lacks in danger it makes up for in speed. This speedy fish is one of the fastest fish in the ocean and is a wonder to behold. When caught, this fish will make huge leaps out of the water that make it both fun and extremely challenging to reel in. This fish is particularly stunning with beautiful features like a massive sail for a dorsal fin and long pointy bill – quite the prize for any fisherman. This may not be the prettiest fish in the world, but they get big. The Atlantic Tarpon can get up to 8 feet long and up to 350 pounds. Bringing this fish in is something like reeling in an offensive lineman from Green Bay Packers. If you find yourself reeling in a fish and getting nowhere fast, chances are it’s a Tarpon. Next time you’re out on Therapy IV deep sea charter boat and you have a fish on the line that that is quite large, it could be one of the monsters above. If you haven’t caught one of these fish before – there’s no time like the present. Visit the Halouver Park Marina and visit Captain Stan on the Therapy IV, he’ll help you reel in one of these monsters. Of the many fish you can catch during your Miami Beach deep sea fishing excursions, few rival the difficulty and prize of the Atlantic Sailfish. Fishermen come from all over the world come to fish the warms waters of South Florida for these prized fish. Therapy IV, a deep sea fishing vessel in Miami Beach, specializes in this particular fish. This species of fish is capable of swimming nearly 35 MPH in sustained speed and some studies suggest up to 60 MPH in short bursts. Reaching lengths up to 10 feet and up to 220 lbs, this is one formidable fish. The sailfish gets its namesake from a beautiful dorsal fin that runs the length of its body. Its other distinguishing characteristic is its long pointy bill which is shares with other billfish in the Istiophoridae family. The sailfish is capable of swimming to depths of 655 feet below sea level and can be found in many deep sea locations throughout the Atlantic Ocean, but exists in large populations around the peninsula of Florida, and more specifically, South Florida and the Caribbean. The sailfish also has trademark behavior in the ocean characterized by its immense speed and unique physical attributes. It swims with its massive dorsal fin down most of the time, but opens its sail when threatened or to give it maneuverability. When caught, the fish will use its incredible speed, building up momentum, and jump out of the water making it incredibly difficult to handle. The many beautiful characteristics of this fish and its high level of difficulty to catch, make it one of the most prized catches among deep sea fishermen. If you’re interested in taking on this formidable fish, stop by the Halouver Park Marina and visit Captain Stan on Therapy IV, for a truly incredible fishing experience. For more info visit Sailfishing Miami .